To get to the UAB from Barcelona, the best option is the FGC train leaving at Plaça Catalunya station, with a ticket price of € 3 (Two zones, and integrated ticket). You have to take one of the two direct lines to the UAB, train S2 or S55 and get off at the station of Bellaterra. The trip takes about 30 minutes. When you get off at the Bellaterra station, you can choose between arriving at the Campus Hotel on foot (500 meters) or taking a free Shuttle Bus (which will only be available march 8th, 9th and 10th). Plaça Catalunya has a Taxi stand. It is located next to Aerobus Stop (blue buses). The travel to UAB will cost 35€ aprox. There are two direct shuttle buses to Barcelona, one line for each terminal. 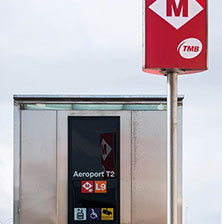 From Terminal 1 the shuttle bus Aerobus 1 (A1), the stop is located in the Bus Station T1 at the exit of the terminal. From Terminal 2 the shuttle bus Aerobus 2 (A1), the stop is right at the exit of the terminal. For both lines, the single ticket costs 5.90€, luggage included. The final stop of the shuttle buses is in Plaça Catalunya. The train station (FGC) is located across the square. 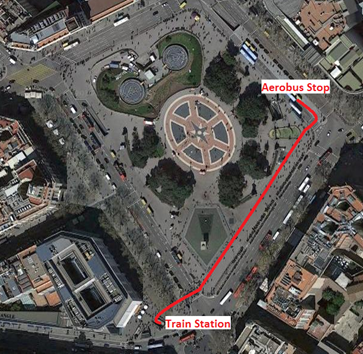 Route between Aerobus Stop and Train Station. There is a train line connecting the airport with Barcelona, Line R2. Airport train station is located 200 mts outside Terminal T2 (Rodalies de Catalunya Renfe trains), with a cost of 4.10€ per ticket. Both infrastructures are connected by a covered footbridge. This footbridge has a section of elevators and escalators in the nearest favouring the access to people with reduced mobility or passengers with heavy luggage. Arriving at the Barcelona Sants station, you have to transfer to any other train stopping in Plaça Catalunya which is just one stop (R1, R3 or R4). Train gateway connection with T2. The metro line connecting the airport with Barcelona city centre is L9. At Terminal 1 the entrance is on Level 0, close to the buses. At Terminal 2 the entrance is next to the train station. The price of a ticket is 4.50€. Transfer in Torrassa Station to L1 (red line) to Plaça Catalunya. 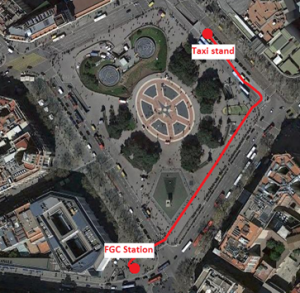 In Plaça Catalunya, you have to change your platform to access the train station (FGC). Access to L9 station at Terminal 2. From Barcelona Sants station, you have to transfer to any other train stopping in Plaça Catalunya which is just one stop (R1, R3 or R4).